In this episode, the Enterprise risks itself in an asteroid field to save a freighter with four passengers: a con artist and three preternaturally alluring women. The rescue attempt cost the Enterprise valuable ship components which need to be replenished at a nearby mining colony. Once there however, the con man, Harry Mudd, tries to turn a profit for himself by offerings his "cargo" as wives to the lonely miners. However, there is a secret to the women's beauty and when it is revealed it may prevent the Enterprise from getting the repairs it needs to keep from falling out of orbit. You know...they can't all be winners, but as far the weaker class of episodes go, this one was at least fun to watch, and a hoot to podcast. Matt and I both ended up grudgingly giving it threes, for a total of six. 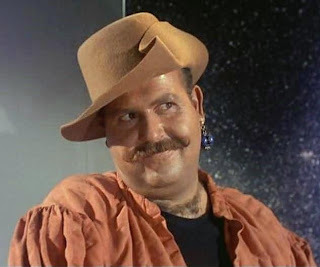 It's a low six to be sure, but Harry Mudd is certainly one of the more enduring guest characters and rightly so. Enjoy the podcast, everyone. It's 56 minutes long and is 51MB in size.